NETWORK FINALS: There was bad news in the adjustments for THE VILLAGE, which dropped 0.1, and at 0.8, lost more than half its THIS IS US lead-in. (With an extra decimal, it was 1.70 vs. 0.84.) Elsewhere, THE KIDS ARE ALRIGHT gained 0.1 in final numbers. CABLE HIGHLIGHTS: USA’s WWE SMACKDOWN gained 0.03 to 0.74, and TEMPTATION ISLAND was down 0.02 to 0.46. On History, CURSE OF OAK ISLAND slipped 0.02 to 0.74, THE LOST GOLD OF WORLD WAR II debuted at 0.33, and an OAK ISLAND lead-in hour was at 0.29. Tru kicked off NCAA TOURNAMENT coverage with the play-in games at 0.57/0.30. Bravo’s REAL HOUSEWIVES OF BEVERLY HILLS lost 0.04 to 0.54, and MEXICAN DYNASTIES was down 0.02 to 0.17. OWN’s THE HAVE AND HAVE NOTS edged up 0.02 to 0.39, and a lead-out episode of IF LOVING YOU IS WRONG was at 0.28. MTV’s SIESTA KEY jumped 0.11 to 0.36. Food Network’s CHOPPED rose 0.09 to 0.33. On TLC, I AM JAZZ climbed 0.06 to 0.30, MY BIG FAT FABULOUS LIFE rose 0.05 to 0.26, and DR PIMPLE POPPER was down 0.05 to 0.24. On ID, DEADLY RECALL was steady at 0.30, and HOMETOWN HOMICIDE was also steady at 0.27. On Comedy Central, TOSH.0 returned at 0.30 (down 0.04 from the September 2018 premiere), and THE JIM JEFFERIES SHOW was at 0.17 (steady). Lifetime’s MARRIED AT FIRST SIGHT gained 0.02 to 0.29. 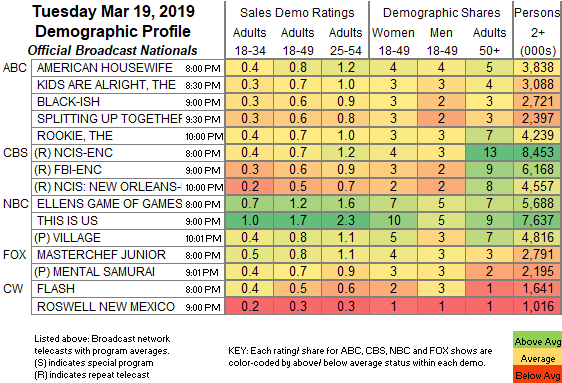 TBS’s MIRACLE WORKERS grew by 0.02 to 0.29. Fox News’s TUCKER CARLSON TONIGHT led cable news at 0.26/0.40/2.9M, with MSNBC’s RACHEL MADDOW SHOW at 0.25/0.41/2.7M, and CNN TONIGHT at 0.18/0.27/1M. 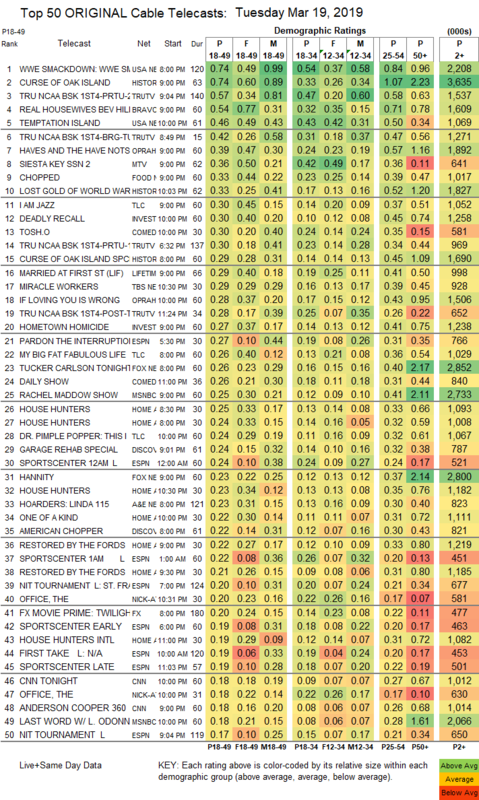 On HGTV, HOUSE HUNTERS was at 0.25/0.24/0.23 compared to last week’s 0.26, ONE OF A KIND was at 0.22, RESTORED BY THE FORDS was at 0.22/0.21, and HOUSE HUNTERS INTL was down 0.07 to 0.19. On Discovery, GARAGE REHAB ticked up to 0.24, AMERICAN CHOPPER gained 0.03 to 0.22, and SHIFTING GEARS was down 0.02 to 0.16. On A&E, HOARDERS drifted down 0.03 to 0.23, and THE TOE BRO fell 0.07 to 0.15. Freeform’s GOOD TROUBLE ticked up to 0.15. On BET, AMERICAN SOUL dropped 0.04 to 0.11, and BOOMERANG was down 0.02 to 0.09. The finale of TV Land’s TEACHERS was steady at 0.07.